It was all going so well. Intergalactic war was over, rocket production had ceased and stellar incineration was about to commence. And just as the bunting was unfurled, a solar flare goes and scatters the ship's memory gears, forcing us into 64 levels of retro puzzle brow-furrowing and chiptune dance routines to stave off the threat of death. For once, though, it's not a platformer. 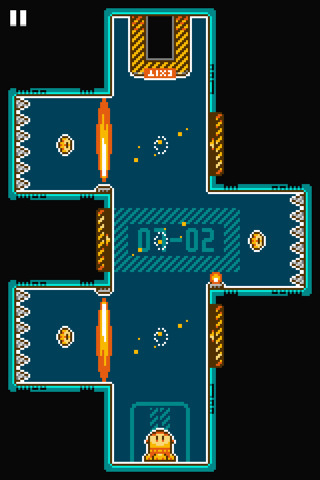 Despite initial appearances to the contrary, you spend most of your time swiping The Last Rocket through various hazard-strewn rooms, negotiating air currents and conveyor belts and dodging flame jets and inconsiderate spikes. En route to each area's exit, you can make yourself more appealing to future lovers by collecting the optional memory gears that (entirely coincidentally) find themselves in dangerous locations. Getting them is another matter. Sometimes you have to perform an initial 'pass' across the outline of a memory gear before it reveals itself, but with life-ending danger at every turn, I wouldn't blame you for zooming headlong towards the exit. Now and then, though, the kleptomaniac within gains control, and you find yourself sweeping with the grace of a conductor, performing death-defying turns and mid-air hovers like you were born to do it. Suddenly it doesn't seem right unless you're dying 20 times per level in focused pursuit of shiny things against the odds. Would this have happened if The Last Rocket didn't look like it was made 25 years ago? Possibly, but then it wouldn't have transported us into the mind of an excitable eighties teen. Requirements: Compatible with iPhone, iPod touch, and iPad. Requires iOS 3.2 or later. What's Hot: Cool 8-bit graphics and music, 64 levels, highly addictive, universal. What's Not: Having to put it down.